Note about unit type. 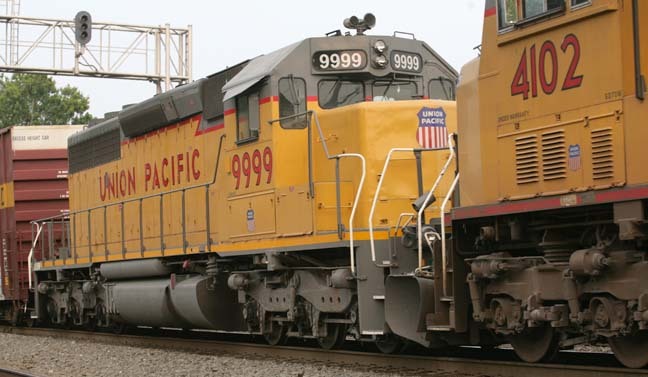 UP apparently calls anything an SD40-2 even if it began as a SD40-2, SD40T-2 or SD45T-2. 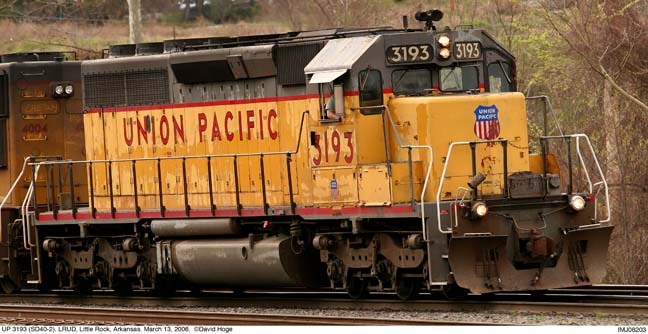 I believe that most SP units were rebuilt to SD40-2 standards as they were shopped, rebuilt and repainted. Some SP SD40-2M were rebuilt from SD40 and SD45. UP 2678 (SD40-2, SD45 carbody). Little Rock, Arkansas. February 12, 2006. UP 2711 (SD40-2) X SP with patch renumbering at Little Rock, Arkansas. September 26, 2004. UP 2744 (SD40-2, SD45 carbody) repainted with lighting stripe on the AKMD at Butterfield, Arkansas. April 10, 2006. UP 2748 (SD40-2, SD45 carbody) at the Jenks locomotive shop during open house at North Little Rock,Arkansas. May 2, 2004. The unit has been repainted with logos honoring North Little Rock's centennial which was celebrated in May 2004. UP 2816 (SD40-2), in SD45 carbody, with patch renumbering, at Mabelvale, AR. January 18, 2002. UP 2831 (SD40-2, SD45T-2 carbody) at Little Rock, Arkansas. February 13, 2006. 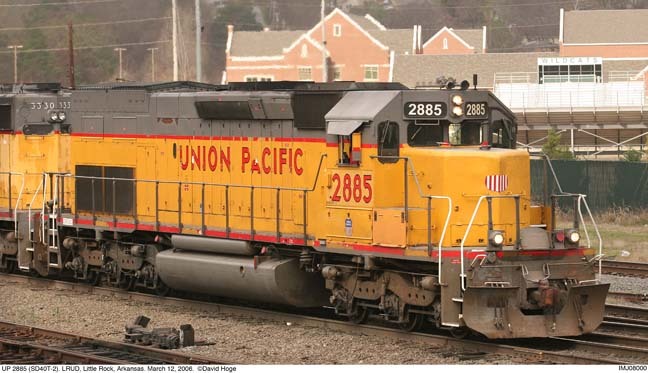 UP 2831 (SD40-2, SD45T-2 carbody), Little Rock, Arkansas. May 29, 2005. UP 2832 (SD45T-2) with patch renumbering at Homan, Arkansas. February 25, 2002. UP 2843 (SD40-2, SD45T-2 carbody). Little Rock, Arkansas. February 12, 2006. UP 2847 (SD45T-2), Little Rock, Arkansas. April 30, 2006. UP 2856 (SD45T-2) northbound Union Station, Little Rock, Arkansas. March 10, 2002. UP 2857 (SD45T-2) at Pine Bluff, Arkansas. December 5, 2004. UP 2885 (SD40T-2) on the AKMD at Butterfield, Arkansas. May 30, 2006. UP 2885 (SD40T-2) at Little Rock, Arkansas. March 12, 2006. UP 2885 (SD40T-2) at Little Rock, Arkansas. February 27, 2006. UP 2903 (SD40T-2) at Little Rock, Arkansas. September 18, 2004. UP 2921 (SD40T-2). Little Rock, Arkansas. February 25, 2006. UP 2947 (SD40T-2). Little Rock, Arkansas. April 3, 2006. UP 2976 (SD40-2) at Rochelle, Illinois. June 20, 2005. UP 3036 (SD40-2) X CNW with patch renumbering at the UP service ramp, North Little Rock, Arkansas. December 13, 2003. UP 3042 (SD40-2) X CNW with patch renumbering at Rochelle, Illinois. June 20, 2005. UP 3098 (SD40-2) with "We will deliver" at Rochelle, Illinois. June 20, 2005. UP 3133 (SD40-2) at Little Rock, Arkansas. February 12, 2006. UP 3135 (SD40-2) at Little Rock, Arkansas. February 27, 2006. UP 3167 (SD40-2) Little Rock, Arkansas. February 20, 2006. UP 3192 (SD40-2) at Union Station, Little Rock, Arkansas. March 26, 2002. UP 3236 (SD40-2) at Union Station, Little Rock, Arkansas. March 26, 2002. UP 3238 (SD40-2) at Pine Bluff, Arkansas. September 3, 2005. Repainted with UP's Lightning stripe and FRA mandated yellow frame stripe. UP 3330 (SD40-2) at Little Rock, Arkansas. February 27, 2006. UP 3338 (SD40-2) on the AKMD at Jones Mill, Arkansas. May 30, 2006. 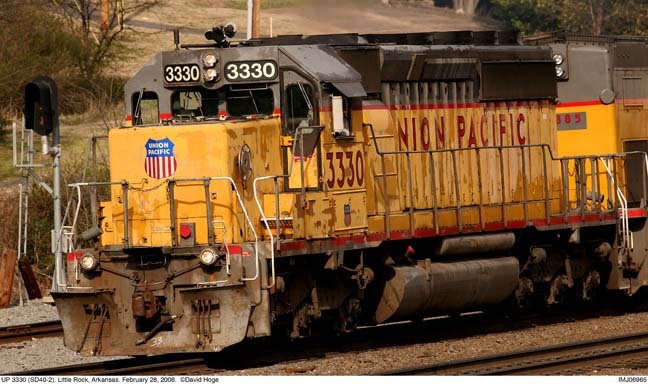 UP 3338 (SD40-2) Little Rock, Arkansas. February 26, 2006. UP 3366 (SD40-2) Little Rock, Arkansas. February 26, 2006. UP 3395 (SD40-2) with "We will deliver" at Little Rock, Arkansas. February 13, 2006. UP 3445 (SD40-2) at Union Station, Little Rock, Arkansas. August 15, 2004. UP 3456 (SD40-2) northbound Union Station, Little Rock, Arkansas. March 10, 2002. UP 3600 (SD40-2) at Little Rock, Arkansas. December 24, 2004. UP 3614 (SD40-2) at Little Rock, Arkansas. January 8, 2006. UP 3763 (SD40-2) in the "We Will Deliver" scheme southbound at Union Station, Little Rock, Arkansas. March 12, 2002. 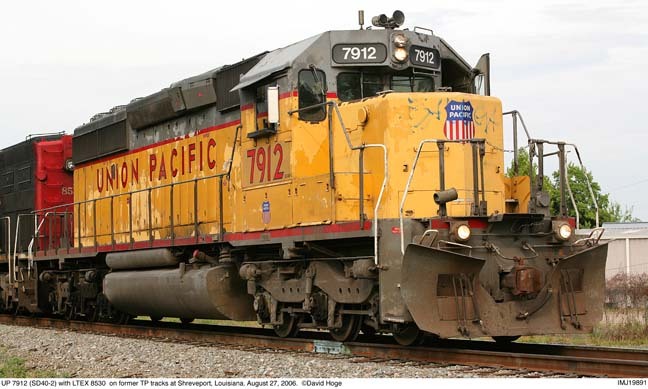 UP 7912 (SD40-2) with LTEX 8530 at Shreveport, Louisiana. August 27, 2006. UP 8589 (SD40T-2) with patch renumbering at Union Station, Little Rock, Arkansas. March 10, 2002. UP 8610 (SD40T-2) X SP with patch renumbering at Union Station, Little Rock, Arkansas. April 14, 2002. UP 8630 (SD40T-2) X DRGW with patch renumbering at UP's Jenks shop, North Little Rock, Arkansas. May 22, 2003. UP 8631 (SD40T-2) X DRGW with patch renumbering at UP's Jenks shop, North Little Rock, Arkansas. May 22, 2003. UP 8635 (SD40T-2) with patch renumbering at UP's Jenks shop, North Little Rock, Arkansas. May 22, 2003. UP 8637 (SD40T-2) X DRGW with patch renumbering at UP's Jenks shop, North Little Rock, Arkansas. May 22, 2003.